Anne McCauley accepts the Frist Student Service Award. Photo by Kevin Bain. OXFORD, Miss. 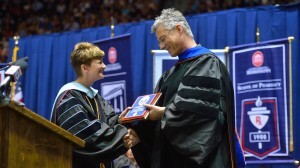 – All University of Mississippi employees contribute in some way to the overall student experience, but some faculty and staff go beyond the call of duty in their commitment to helping students. The annual Frist Student Service Awards honors those dedicated individuals. 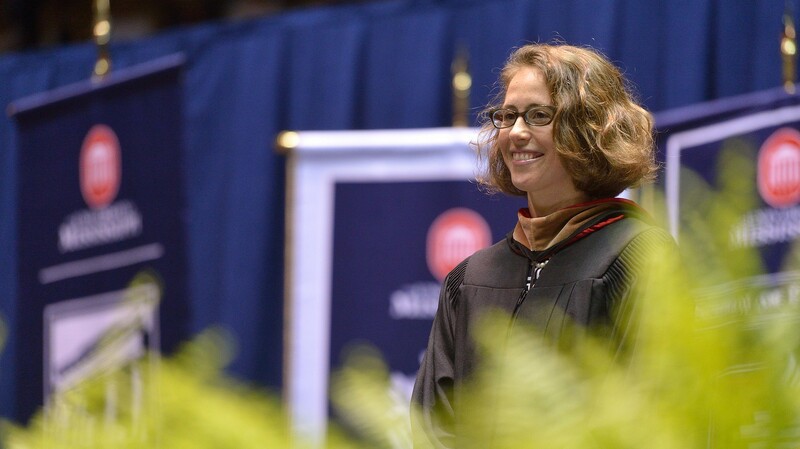 During the university’s Commencement ceremonies Saturday (May 9), Anne McCauley, UM assistant director of sustainability, and Luca Bombelli, associate professor of physics and astronomy, were introduced as the 2015 Frist winners. Service is a key commitment that is asked of everyone at the university, Chancellor Dan Jones said. For this reason, the Frist award is a special and important honor. The award was established 20 years ago with a financial gift from Dr. Thomas F. Frist Sr., a 1930 UM graduate from Nashville. Frist is the founder of Hospital Corporation of America. Since 1995, the Frist Student Service Awards have honored one faculty member and one staff member. The two recipients receive $1,000 and a plaque. Both of this year’s recipients said they were humbled by the recognition. 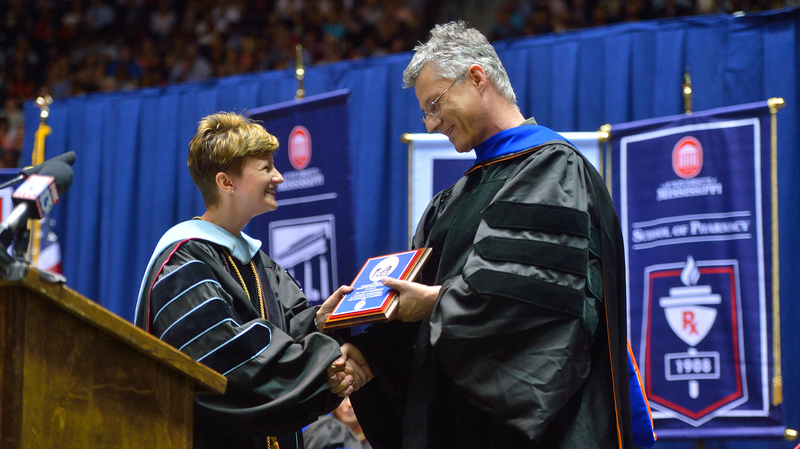 Bombelli, who joined the faculty in 1999, said he was surprised to win the award. One international student in the doctoral program said that when he first arrived, Bombelli went to great lengths to help him get connected with another student who became his roommate. He also sent someone to pick up new students at the airport and helped them get hotel rooms once they arrived. He is also very valuable as a mentor. Brandi Hephner LaBanc presents Luca Bombelli with the Frist Student Service Award. Photo by Kevin Bain. Bombelli also listens to students’ opinions. He organized luncheons for students to get to know job candidates for two faculty positions and passed their input on those selections to the department chair. McCauley, who joined the UM staff in 2008, said the students make her job rewarding. Sustainability efforts on campus require lots of dirty jobs, which include sorting through mountains of recyclable materials after home football games. McCauley often works right beside her student workers to help the university meet its sustainability goals. She also has been a champion of the university’s goal to become more bicycle-friendly. Away from campus, she prepares dinners for graduating student interns. One student intern sang McCauley’s praises in his Frist nomination letter. He said he wasn’t treated like an intern; rather, he was treated as an important part of the team. This allowed him to learn a lot about the workings of an institution of higher learning, which will serve him well in his career.